Young performers developed their confidence putting on a musical show. 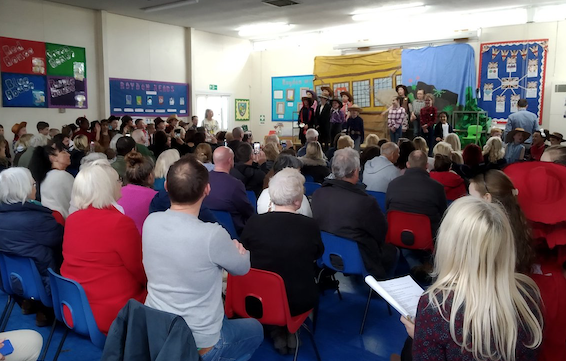 Year 3 and 4 pupils at Roydon Primary Academy, in Roydon, performed the musical Ye-ha. The story is set in the American Wild West and follows Wilbur Hubbard, a wimpy cook who suddenly finds himself employed as sheriff, but does not feel up to the task. He is helped by brave cowgirl Billie-Jo Briskett, who helps Wilbur sees the true hero inside him as they battle against a no-good gang of outlaws, led by Mad Dog Mcnutt, and the corrupt mayor, Tex Truman, who wants to take over Splodge City for his own selfish desires. Matt Girvan, Year 4 teacher, said: “Putting on a play is a fantastic opportunity for young children to develop their confidence, as well as their drama, singing and public speaking skills. “The children of Year 3 and 4 rose to the occasion magnificently, performing the lively and humorous play with enthusiasm and gusto. Some of the children even performed solos in front of a packed hall of adults and children – a brave feat for an adult, let alone a 9-year-old.